Taking New Patients Starting May 2019!!! Ms. Stokes is from a military family and was raised all over the southern United States. 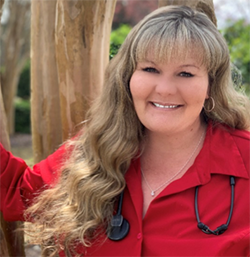 She moved to the Lowcountry of South Carolina in 2000 where she became certified as a Registered Nurse. She worked locally in the emergency department until 2011 where she took a Nurse Manager position with the Department of Veteran Affairs. She returned to the University in 2012 where she received her master’s in nursing education. In 2014 she decided to continue her studies and fulfill her life-long dream of becoming a Nurse Practitioner. Ms. Stokes has been practicing as a board-certified Family Nurse Practitioner and specializes in family medicine, sports medicine and urgent care. Ms. Stokes is actively involved in the community and volunteers her time with the local schools, youth sports programs and local law enforcement agencies. She comes from a large family and is blessed to have them all live here in the Lowcountry. She will tell you her most important job and greatest accomplishment is her son, Riley. On any given day you can find her near a football field, baseball field or cheerleading gym rooting for him, her nephew or nieces.